In the second section, quotations from the Anglo-Saxon Chronicle are used. These are taken from the translation by Rev. James Ingram (London, 1823). This is available online at: http://omacl.org/Anglo/. 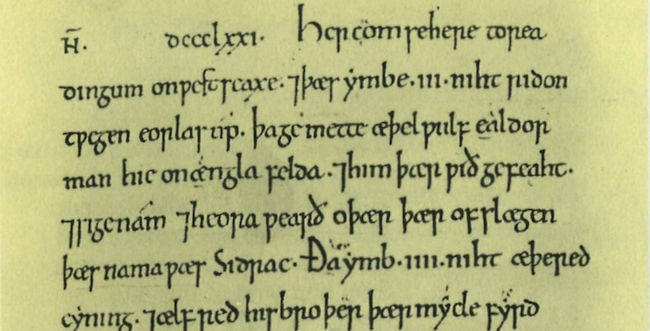 There is a problem with dates in the Anglo-Saxon Chronicle, as the modern practice of starting the year on 1 January was not universal. For this website I have followed the dates given in Dr David Hill’s An Atlas of Anglo-Saxon England. The distribution of the Viking raids in England for the period 789 to 839 gives the impression that England and Wales suffered relatively little interference, especially when compared with the activity in Ireland. This may be a mistaken impression, as the English chronicles is slight until 850. The Irish chronicles, on the other hand, were well established by this time. During the period 845 to 866, much of the Viking activity centered on the Continent, so that the relatively little activity in the British Isles shown on these maps probably represents a true state of affairs. It has been said that to Charles the Bald fighting against his brothers to retain his throne, the attacks of the Vikings were like the buzzing of a wasp in the hair of a man being strangled. There must, however, have been serious disruption in all aspects of life, and Charles instigated a series of defensive measures, including fortified bridges such as the one at Pont de l’Arche. By 865, these defences may have made England seem a more attractive proposition.